The word Revelation means, unveiling, the veil of the future is lifted from the eyes of believers and the plan of eternity set forth. A blessing is promised to those hear, read and keep the words revealed. Chapter 1 introduces us to the rest of the letter, establishing the background. John answers the questions, who is the author? what are the circumstances behind the letter? How it was revealed? and Who revealed it? The first chapter shows Christ in his glory appearing to his servant John. 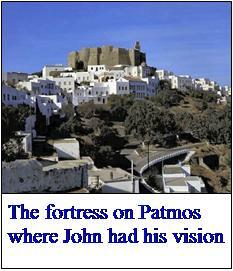 Christ comforts John, who is on Patmos for his testimony of Christ, he assures John, He is in control. Jesus Christ reaffirms his nature and identity in this chapter, anticipating the apostasy to develop in the church as his nature and work in the future would be denied. Revelation: The Greek word is ajpokavluyi Apokalupsis and means laying bear, making naked, disclosure of truth. The letter is from God the Father to Jesus Christ, signified by His angel, to John for the church. Jesus removes the veil, and allows His church to see the plan for eternity. His servant: The word servant comes from the Greek word, dou’lo Doulos meaning, a slave, bondman, man of servile condition. Those who trust Christ, become his servants. We are representatives of Jesus Christ in this world, to announce his kingdom and establish his salvation in the earth. A servant does the master’s will, not his own. We are called in service to administer the kingdom. The letter is to the servants of Christ, for this reason, unless someone is Christ’s servant, the letter makes no sense. Shortly take place: The Greek word, tavco Tachos meaning, quickness speed. The events revealed to John have immediate application. In the 63-years since Christ death on the cross, the Church had grown from Jerusalem to encompass the whole Roman Empire. There were literally hundreds of churches established throughout the Empire and beyond. Signified: The Greek word shmaivnw Semaino means, to give a sign, to signify, indicate. The book of Revelation is filled with signs and symbols. For the most part, the explanations of these signs are within the context of the scripture or within the whole body of scripture. For example in chapter one, Jesus, glorified, stands in the center seven lamp stands holding seven stars. In verse 20, we find the meaning of the lamp stands and stars, the lamp stands represent seven churches and stars, seven angels. Angel: The identity of the angel is subject to speculation. Gabriel is the most likely candidate. Gabriel first identified in Daniel 8, communicates the message from God’s throne to God servants. Gabriel is seen again in Daniel 9 and in Luke 1:19, 26 where the birth of John and the Messiah is announced. The word of God: In this letter, John is an eye-witness merely reporting what he sees. The word witness comes from the Greek word, marturevw Martureo where the word “martyr” is derived. John personally testifies about what he has sees. That he saw: From Chapter one to the last chapter, 22, John stats 38 times that he personally “Saw” the events taking place. 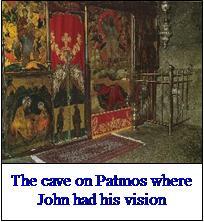 John, as a servant to Christ is reporting what he has seen to the churches. Blessed: Revelation is the only book of the Bible with the promise blessing to the reader. 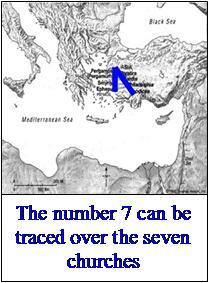 The number seven signifies in scripture completeness. Peter asked Jesus, “Lord, how often shall my brother sin against me, and I forgive him? Up to seven times?” , Jesus replied, “Seventy times seven”. This same number “Seventy-times seven” Gabriel tells Daniel is the completeness of time on his people and his holy city (Daniel 9:24). The Seven Churches here are seven geographical churches located in Asia. The message goes beyond the churches and is also addressed to those who have “ears”. The message is to the whole church, much in the same way the epistles (Corinth, Galatians, Romans, Timothy, and Titus) are addressed to specific cities and people, but apply to the whole church body. Starting from Ephesus, to Laodieca a number seven can be traced over cities addressed. Grace: The Greek word used here is cavri Charis its equivalent to the Hebrew word Shalom meaning peace. The greeting is from the Trinity, Father, Son and Holy Spirit to the Church. Him who is…was…is to come… The first part of this salutation is from the God the Father (Rev. 1:1), who gave the message to Jesus, who relayed this message through his angel to his servants. Another view is the “Seven Spirits” mentioned before the throne is the fullness of Holy Spirit. Isaiah reveals the seven-fold nature of the Holy Spirits ministry. ISA 11:2 The Spirit of the Lord shall rest upon Him, The Spirit of wisdom and understanding, The Spirit of counsel and might, TheSpirit of knowledge and of the fear of the Lord. Here the seven-fold ministry of the Holy Spirit addresses the church, before the throne of God. The number seven representing fullness represents the complete ministry of the Holy Spirit. Jesus Christ: Addressing the church is the Father, the Holy Spirit and Jesus Christ. What follows are descriptive qualifiers of who Jesus is, what he did and what will occur. Over sixty-years have passed from the Cross to Chapter one. Despite this short period, already, false doctrines and heresy have infected the Church by A.D. 96. The proto-Gnostic movements taught by the Nicolations and Jezebel mixed the Gospel with Greek paganism. Jesus condemned this aspect of the churches in Pergamos and Thyatira. More heresy would follow in the coming generations. Like the churches of the first century, the issue of who is Jesus? and what work did he do? are addressed in this salutation. These versus declare Jesus’ personal death for our sins, his position over the kings of the earth and his personal physical return. Revelation 1;5-8 proclaims the dual nature of the Messiah, “Suffering Servant” and ‘Conquering King”. Christ anticipates the coming false teachers and answers their charges before hand. John in his letter qualifies the person of Jesus. Faithful Witness: Jesus faithfully proclaimed his identity. He did not fail in His mission as some cults like to claim today. First born from the dead: The position of ‘First born” is right to inheritance. Jesus was not the first person ever resurrected. Jesus attained to the position of “First Born”, meaning the right of inheritance. Adam like all who followed him died with a sin nature. Christ redeemed what Adam lost, giving him the right of inheritance, belonging to the “First Born”. The position of “First-born” will be the Messiah position, over the kings of the earth as the “Son of Man” he inherited Adam’s loss. 27 Also I will make him My firstborn, The highest of the kings of the earth. 28 My mercy I will keep for him forever, And My covenant shall stand firm with him. 29 His seed also I will make to endure forever, And his throne as the days of heaven. Ruler over the kings of the earth: Christ will rule over the Kings of the earth as their kingdoms pass away at his Second Coming. The Messiah will rule over the nations, as proclaimed in Psalm 2, Isaiah 11:1-6, Daniel 7:14 and Isaiah 52;15. Loved Us: Jesus died, not because he was powerless to resist Roman authority, but because he loved us, his death was an act of love. Cults such as the Reverend Sun Young Moon, (The Unification church) teach Jesus died because he failed at his mission. John 3:16, teaches Jesus died because God loved the world and wanted to save humanity. John affirms the reason of His death. Washed us: Another heresy, to make its way into the Church is the doctrine of “works salvation”, teaching, we are saved by works. John counters this doctrine by proclaiming, Jesus “Washed us” the work was His cleaning, not our cleaning. By His cleaning alone, we are cleansed. Jesus answered Peter, who rejected Christ washing his feet before Passover; Peter can have no part of Christ without Christ washing him. His own blood: The blood of Christ alone saved us and restored our relationship with the Father. Later in many of the Churches would arise cults which would deny the physical death of Christ and his atoning blood. Islam contains the Gnostic teaching of Basilides who taught the Romans did not crucify Jesus but a phantom, the real Jesus did not die on the cross but was taken into heaven. John counters the future charge here. Coming with the clouds: In Acts when Jesus departed to Heaven, the two angels proclaimed to the men of Galilee, (Acts 1:10) Jesus who was taken up into heaven in a cloud would appear in like manner. More then 500 years before the event, Daniel proclaimed the coming of the Son of man in the clouds. “Then the sign of the Son of Man will appear in heaven, and then all the tribes of the earth will mourn, and they will see the Son of Man coming on the clouds of heaven with power and great glory. John anticipates future false doctrines denying the physical return of Christ. Every eye will see him: A growing interpretation of Revelation is known as the Preterist (Past) view. They view the events of Revelation as already having occurred. Preterist view the Olivet Discourse, including most of Matthew 24 as being fulfilled in A.D. 70. Moderate Preterist still anticipate a visible second coming of Christ, when Christ visibly appears in glory. An off-shoot of this group known as Hyper-Preterists believe Jesus has already physically returned. This is a heretical teaching. The Seventh-Day Adventist, Jehovah Witnesses also teach a similar heretical teaching believing Jesus returned to the outer atmosphere in the early 1900’s. They developed these teaching to cover false prophecies by their false prophet leaders, Ellen G. White and Charles Taze Russell. The Scriptures from the Old and New Testaments clearly teach of the Glorious return of Christ when every eye will see him, “Even those who pierced him”. Quoting from Zechariah 12:10, John affirms his physical, the return of the “rejected” “Suffering Messiah”. At His second coming, every eye will see his return. After Jesus’ side was pierced with a spear, John in the Gospel also quotes Zechariah 12:10 (See John19:34,37). Alpha Omega: Jesus called the “Word of God” in John 1:1 and Revelation 19:13, here uses the first and last letter of the Greek alphabet to proclaim he is the A to O (A to Z). This is again used in Revelation 1:11, 21;6 and 22;13. John answers those who would deny the deity of Christ. Who is, was…is to come: Here the same words used to describe the Father in verse 4 are now used to describe Jesus Christ. 13 and in the midst of the seven lamp stands One like the Son of Man, clothed with a garment down to the feet and girded about the chest with a golden band. 18 “I am He who lives, and was dead, and behold, I am alive forevermore. Amen. And I have the keys of Hades and of Death. John: A prisoner on Patmos in his old age, John according to some accounts was placed on the island after they failed to kill him. He was forced to work in the mines of the Roman Emperor Domition mines. For…Jesus Christ: John was not ashamed of his witness for Christ. Demonstrating suffering for the Gospel is not to be avoided when presented with the alternative. The willingness to suffer for the cause of the Lord is seen by Daniel and his fellows. (Daniel 1,3,6) Through our suffering God’s glory is exalted. Suffering for Christ sake contrary to human nature is not a benefit we bestow on God, but a blessing God bestows on us. Suffering for Christ is demonstration of God’s favor, because when we suffer for Christ, we partake in his suffering. In the Spirit: John describes his state at the time of the Revelation. He describes himself as being “In the spirit”, this term is used four times in Revelation, (Revelation 1:10, 4:2, 17:3,21;10). Ezekiel also refers to being, “in the spirit”. In each case, John and Ezekiel report leaving their physical location and being transported to place and witnessing events taking place in a spiritual realm. Ezekiel then explains events taking place in the future as Israel is restored to her land and becomes a great nation, confronting the nations of the world. Ezekiel is looking forward to future event known as the “Day of the lord”. 9 Behold, the day of the Lord comes, Cruel, with both wrath and fierce anger, To lay the land desolate; And He will destroy its sinners from it. The most logical verdict is John, “In the Spirit” is taken forward to the day of the Lord’s wrath, the time of the tribulation. Heard behind: John, “In the Spirit”, hears a voice him which sounds like a trumpet. The voice identifies Himself as Christ glorified. The names used by the voice reinforce His deity. Knowing in the future, cults such as the Gnostics, Arians, Islam, Jehovah Witnesses and Mormons would rise, each challenging the identity of Jesus Christ. Here his identity as God is unmistakable. Alpha Omega: The person identifies Himself as the Alpha and Omega, who we know is Jesus Christ the son of God, Almighty God. What you see: John’s job is to convey the message he sees. Jesus is asking John to report what he sees in a book and send it to the churches. Book: The Greek word translated book is biblivon Biblion meaning a small book, a scroll, a written document. Seven churches: Jesus tells John to write a book to the seven churches. These churches are seven specific geographic churches in seven literal locations. However, like the epistles, their application does not end with the church itself. There are four audiences addressed in these letters. The letter is addressed to seven physical churches in Asia. The letter addressed to the servants of Christ, includes the seven churches and “He who has an ear”. This phrase is used after each Church addressed. Ephesus (Rev. 2:7), Smyrna (Rev 2:11) , Pergamos (Rev 2:17) Thyatira (Rev 2:29), Sardis (Rev 3:6), Philadelphia (Rev. 3:13) Laodicea (Rev. 3:22). The letter would also be addressed to Seven church types. Today, all churches can be categorized to “Church Type” located in Revelation. A fourth way of looking at the Seven churches are by examining the Seven church ages of history which can be demonstrated to correspond to the seven churches in Asia. Seven Lamp stands: When John turns, he first sees Seven Lamp stands made of Gold. These appear to be individual lamp stands, as opposed to the one seven branched Menorah Lamp standing in the Temple. Jesus in the center is the source of the light, he stands glorified in the midst of the lamps. 15 “Nor do they light a lamp and put it under a basket, but on a lampstand, and it gives light to all who are in the house. 16 “Let your light so shine before men, that they may see your good works and glorify your Father in heaven. Son of man: The name “Son of Man” is the most common term Jesus used for Himself. 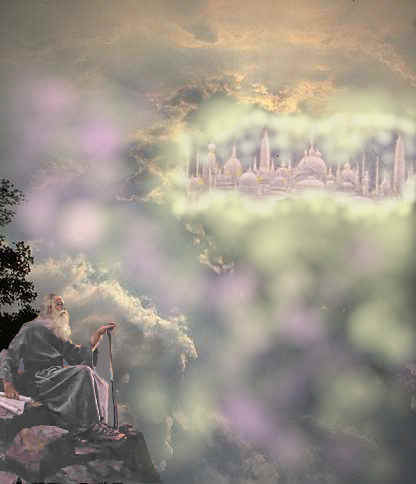 Daniel in chapter 7, pictures the “Son of Man” arriving on the clouds in the presence of the Ancient of Days (Daniel 7;13) The description which follows is similar to the one found in Daniel 10:5-6, both are described as being girded with a golden band and clothed in linen. An item worn by the Jewish Priesthood administering before the Holy of Holies, is a girdle holding an ephod and linen garment. Jesus is our High Priest,(Hebrews 7) the purpose of church is to illuminate Christ, The world sees Jesus from the light reflected by the Church body. 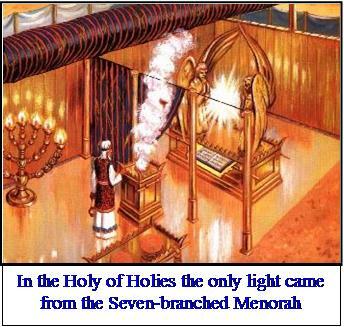 The only light in the Holy of Holies was the light from the Seven-branched lamp stand. We are the light in the world to reflecting Christ. Two-Edged Sword: rhomfav Rhomphaia is large devastating sword, refereed to five times in the book of Revelation. This sword opposed to the “quick” sword of Hebrews 4:12, (mavcaira Machaira )is heavy and is associated with devastating judgment. The word of God cuts two ways. One way for people, convicted of their sins, they accept Christ. The sword cuts another way for those who reject Christ, damnation. Do not fear: Jesus tells John to not fear. Christians do not have to be afraid of eternity. Jesus Christ controls the universe. He has the keys to eternity. We can rest in Him and His promises. 19 “Write the things which you have seen, and the things which are, and the things which will take place after this. 20 “The mystery of the seven stars which you saw in My right hand, and the seven golden lamp stands: The seven stars are the angels of the seven churches, and the seven lamp stands which you saw are the seven churches. The book of Revelation spans time, from the Apostolic church, through the Millennium to Eternity. The book is divided into three time-periods. Things you have seen: The Book of Revelation is an eye-witness account of what John saw. John did not imagine or dream, he actually saw what he writes about. Like Ezekiel, John is taken, “In the Spirit” and records what he saw. John writes what he has seen in Chapter 1. Things which are: John was in the Church age, his letter addresses the churches in Chapters 2 and 3. Things which will take place: Revelation speaks to the future, what follows the Church age, the Tribulation, the Millennium and Eternity. Two-Edged Sword: rhomfav Rhomphaia is large devastating sword, refereed to five times in the book of Revelation. This sword opposed to the “quick” sword of Hebrews 4:12, (mavcairaMachaira )is heavy and is associated with devastating judgment. 20 “The mystery of the seven stars which you saw in My right hand, and the seven golden lampstands: The seven stars are the angels of the seven churches, and the seven lampstands which you saw are the seven churches.